A woman armed with an automatic weapon has shot dead one person at a hospital in Germany before being killed by police. A police officer was also injured in the incident in the town of Loerrach near the French and Swiss borders. Police believe the shooting is linked to an explosion at a nearby building where they found the bodies of a man and a child. Authorities have sealed off the area and say the situation is under control. The shooting happened shortly after 1800 local time (1600GMT) on Sunday. Police say there was an explosion in an apartment block opposite the hospital, after which witnesses saw the woman run from the building and into St Elisabethen hospital holding a gun. The woman killed a male nurse and critically wounded a police officer who happened to be in the hospital at the time. When police arrived at the scene, the woman turned the gun on the officers, who shot back and killed her. 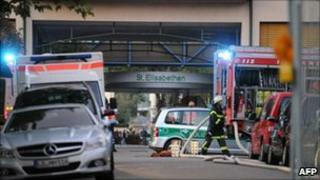 Eyewitness Siegfried Schmid said he heard the explosion and then saw the woman load her gun and run into the hospital. "She headed straight to the gynaecology station. Then she shot someone," he said. "I ran downstairs and finally the police arrived. I took them to the first floor. She immediately began to shoot around again and wounded a policeman in the knee." Prosecutors say a domestic dispute may have triggered the shooting. Neither the woman nor those found dead in the flat have been named.